I recently read most of this book (“most” because I was reading The Brainy Bunch at the same time and juggling all of my other responsibilities, and the book was so overdue that I almost felt guilty showing my face in the library while holding the book hostage, so I finally gave it up even though I hadn’t finished it). So now I am sharing what I learned from the Duggar girls in this book. I love the Duggars! I just think it’s so cool that they live their lives according to scripture. I don’t agree with all of their interpretations (for example, they don’t dance, but what about the scripture that says, “Praise his name with dancing”?) but I love them anyway. They are devout Christians and have led many people to God. Go Duggars! I also love that they are so willing to have as many children as God will give them. That takes bravery people! Michelle is a recovered bulimic. She has learned from the eating disorder and has shared her struggles with her daughters to help them feel like they can talk to her about anything. The Duggar girls say as they have gotten older they tend to put on weight and have to watch what they eat. The girls say that they like to dress modestly by sometimes using tank tops under their tops to create higher necklines. See the video below for tips on their “modern modest” style. I have to disagree with Jinger, I like tie-dye T-shirts! I guess that’s because I am partly a child of the 70s. I agree with Michelle on avoiding heels everyday. I do wear them occasionally but not everyday. The girls suggest the web sites beautifullymodest.com and totallymodest.com for modest formal clothing (hey, those companies are both in Utah, probably owned by Latter-day Saints!) and wholesomewear.com as a source for swimwear. (Personally, I think the modest swimwear offered by swimmodest.com is much more stylish. Maybe the Duggars will eventually learn about it). The video above gives some of their fashion and shopping tips. The girls divide the book into categories of relationships. Each chapter is about relationships with first yourself and God, then your parents, your siblings, friends, guys, your country, and then your world. The girls say that they know they can talk with their parents whenever they need to. Their parents have a 24/7 open heart, open door policy to listen to their kids when they need to talk. Of course, they said sometimes their dad has to fight his eyelids closing if it’s after midnight. Reading about this was a good reminder to me to let my kids know that I have the same policy, although I am much more likely to stay awake like Jim Bob if it’s before 11 PM. “If the Lord shows you something from scripture, then you have a responsibility to respond to that guidance.” It’s as simple as that, isn’t it? 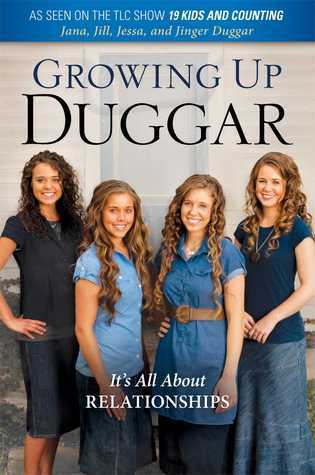 Thank you Duggar girls, for being so plain and bold. The Duggar parents have taught their children to obey, with four qualities. If the obedience doesn’t have these four qualities, it isn’t true obedience. These are are the four qualities: instant, cheerful, thorough, and unconditional. I am going to work on these with my kids! Good scriptures to repeat during fearful times are: Psalms 56:3, Hebrews 13:5, Psalms 23, Ephesians 6:10-20, and Romans 6. Have a prayer target. This means that you have someone in mind that you will pray for when you feel temptation come upon you. I attribute the whole story of the Duggar family’s success to one woman: Jim Bob’s mom. In the book the Duggar girls share how amazing Grandma Duggar is. She became a Christian as a teen and started going to church. No one else in her family went to church. Her brother made fun of her. But she persisted and kept going. Eventually both her siblings became Christians. She got married and had Jim Bob, who was raised Christian. Jim Bob was prepared for his great Christian life by his mom. He attracted Michelle in part because of his Christian upbringing. The Duggar girls say the best way to be a friend is to point others to Jesus.